This is a visual I designed based on a little sketch my pastor's wife (a nouthetic counselor) drew to illustrate a similar diagram NANC uses in counseling clients. As all battles with sin begin in the mind, an individual needs to learn how to practically "take thoughts captive to make them obedient to Christ" in order to have long-term victory over sin. All habits are formed by repetitive practice, and good habits (such as stopping destructive thoughts dead in their tracks, and deliberately choosing to replace them with God-honoring ones) are no exception. However, we must be deliberate about "putting on" the biblical answer when tempted to let our minds go down paths they shouldn't. I printed out a few of these for the women in my Bible study, and several of them told me they found it very useful. Each time you are tempted or a thought comes into your mind that you know is not from God, try to see yourself as actually taking a decision whether to dwell on it or not. Will you take the easy way, allowing your own thoughts and emotions to dominate? 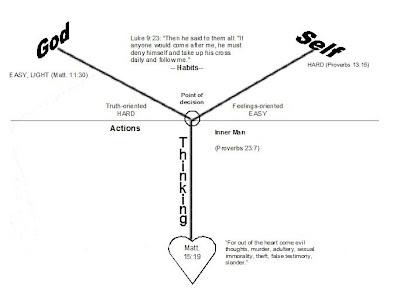 Or will you choose the mind of Christ - which seems more difficult in the moment, but leads to freedom? Ask yourself what God's Word has to say on the situation in question, and decide to react accordingly. Over time, you will develop a habit of "screening" your thoughts through the filter of the Word.